In response to the numerous prayer requests for those facing surgery, we are pleased to offer this Akathist to St. Luke, the Blessed Surgeon. 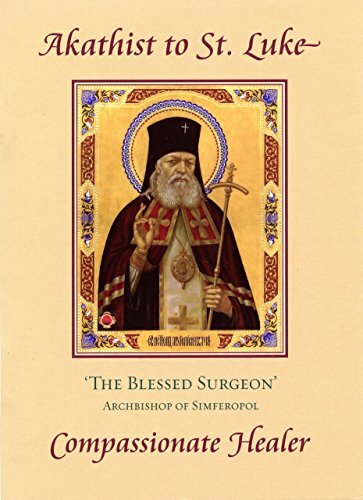 St. Luke of Simferopol—the renowned surgeon and revered hierarch of the Church—was a true father, shepherd and healer for the faithful through decades of Communist persecution. His grace-filled skill as a surgeon, even in the worst conditions, brought healing to countless people wherever he was—whether in one of the great hospitals or in exile, at times operating on a wooden table with only a pocket knife. Miracles still abound through the grace of his intercession, and thousands flock to his holy relics. This pocket-sized, user-friendly edition is printed on glossy paper, just as the others in the Series. Both cover and inner pages are in full color, including two icons of the saint.